Settlement in Monadnock Number Six came quickly once it got started. A list of settlers in the Masonian Papers in 1770 showed 5 settlers. In the three reports on settlement produced in 1773 and 1774 there were fifty-four different family names identified as moving into Monadnock Number Six. The final pre-incorporation survey of settlement detailed thirty-three houses and four camps in Nelson. The houses were almost all log cabins (24) but the nine frame houses were testament to the existence of a sawmill at the outlet of Center Pond. There was a gristmill at the outlet of Silver Lake as early as 1771. The settlement pattern could best be described as uneven. The town had been divided into four quarters named for compass quadrants and after their principal landowners: The Northeast Quarter was called Batchellor’s Quarter. The Northwest was Packer’s Quarter. The Southeast Quarter was called Blanchard’s Quarter and the Southwest Quarter was named the Proprietor’s Quarter. There was no settlement at all in Packer’s Quarter until after the Revolution. The area we know today as Munsonville was entirely undeveloped. The quarters were further divided into rectangles of approximately 100 acres and the early land sales were made in these units so no clearing was very near another. Most cleared plots were small. Sixteen were less than five acres; eleven more between six and ten acres and thirteen farms had cleared more than ten acres. From the earliest days crude roads, often only bridal paths connected the emerging farms. Breed Batchellor had arrived first and seems to have purchased a farm already being developed by a mysterious early settler named Josiah Billings. By 1774 Batchellor had a frame house and barn with one hundred acres cleared. That one farm accounted for 25% of the cleared land. The next farm in size belonged to the town’s second settler, Nathaniel Breed. Dr. Breed had built a double pole house and had 45 acres cleared. His son-in-law and near neighbor, Abijah Brown, built a board house and cleared 25 acres. John Adams, Aaron Beel, Joseph Stanhope and James Bancroft had cleared 20 acres each. At more than a mile apart, none of these early clearings abutted each other. 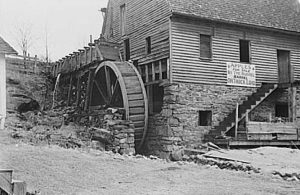 Image of a Grist Mill. Whether a settler lived in a log cabin or a board house depended on when that settler arrived and when the sawmill at the outlet of Center Pond went into operation. We could possibly date that to around 1771 or 1772 based on the arrival of James Bancroft and Abijah Brown in 1771, the first residents after Breed Batchellor to build frame houses. Batchellor’s sawn lumber undoubtedly was milled in Keene. John Farwell bought his land in 1772 and built a frame house. Elihu Higbe, the first housewright, bought his property in October of 1770. Information from early deeds tells us much about the early settlers. In addition to the names of the buyer and seller, the price date and property description, early deeds tell us where the parties lived and what their primary occupation was. Most came from Massachusetts while some came from Connecticut and others from nearby towns: Swanzey, Keene and Dublin. Most were farmers by trade. Deeds for forty-nine early settlers exist at the Cheshire County Registry of Deeds detail twenty-nine yeomen, ten husbandmen, two gentlemen, two doctors, and one miller, housewright, cordwainer, blacksmith, cooper and laborer. Yeomen were substantial farmers who owned their own farms. Husbandmen were smaller farmers who either worked on the farms of others or owned small farms themselves. The great majority of lots in early Nelson were purchased using mortgage financing. All undoubtedly raised much of their own food, but the early population of Nelson could get barrels for storing food from Amos Skinner, the local cooper; get their harnesses repaired by a cordwainer named Joshua Lawrence, their nails from Aaron Beel, the blacksmith; proper frame houses built by housewright, Elihu Higbe, their grain milled by Daniel Wood and have their medical needs looked after by Dr. Nathaniel Breed or Dr. Thomas Frink. One wonders how all these people came to settle here. The farmers were probably looking for cheaper, bigger farms. The skilled people probably saw a market with houses to build and equipment to repair as the land was cleared. With the rough work and plenty of births there was work for doctors and midwives, too. Did these people find Packersfield on their own or were they recruited? The fact of one only one each of several critical tradesmen suggests recruitment. The new town needed the variety of skills these settlers represented. A number of them came from the same towns in Massachusetts. There were five families from Mansfield, four from the Rutland/Princeton area and three from Hubbardston. We can be fairly certain the first two mills were not an accident. 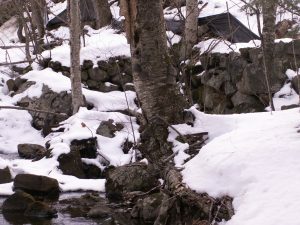 Breed Batchellor built the sawmill at the outlet of Center Pond and it is virtually certain Daniel Wood was recruited to build the gristmill at Silver Lake. Early proprietor’s records for Keene reveal that the proprietors paid a very handsome subsidy to a miller to set up and run a gristmill for the town. Gristmills undoubtedly were expensive to build and the miller often took his pay in the form of a portion of the grain produced by grinding a farmer’s wheat, rye, Indian corn or barley. Establishing a mill for a settling town would be both costly and speculative. At the same time the proprietors could not attract settlers without both a gristmill and a sawmill. We know our first miller, Daniel Wood, did make some money for his effort. He bought the six-acre site of the future mill for 1 pound 16 schillings in June of 1771 and sold it, with building and a gristmill on the property, for a 55 pound profit in February 1774. That was enough money to buy a 100 acres farm with some land cleared and a log cabin. No record of him residing in Mondnock Six after the sale exists. William Beal became the next miller at Silver Lake. As Monadnock Number Six became Packersfield it would need roads, a meetinghouse, a minister of the gospel, schools and a full, working town government. It was on the cusp of becoming a real town. Sources: Nelson Town Records, New Hampshire State Papers: Town Charters; Deeds of land: Cheshire County Registry of Deeds; Samuel Wadsworth, in his Historical Notes with Keyed Map of Keene and Roxbury 1932, and New Hampshire State Papers Volume VIII.